Can a second generation immigrant to the UK find his sense of identity against a background of ballroom dancing in Birmingham? That’s the topic explored by Saikat Ahamed’s gently autobiographical show for the Travelling Light company. Ahamed opens his show with the bland assertion that ‘life is full of boxes’, and his Strictly Balti show details his struggle to identify which, if any, box he fits into. Growing up in Birmingham, Ahamed wrestles with his alter-ego, Sid, who wants nothing more than to fit in with his playground friends. But his family ties to Bangladesh give him an alternate point of view, and it’s only when a death in the family sends him back to his parents’ home that he’s able to reconcile his ancestry with his enthusiasm for all things British. Something of a rebuke to newspaper headlines about immigration, Ahamed is a skilled and charming narrator, who quickly establishes a warm rapport with his audience, and makes good use of minimal stagecraft under the direction of Sally Cookson. If there’s a flaw, it’s that Strictly Balti is too nice; Ahamed’s experiences are decidedly universal and his remembrances of his childhood passions are crafted in such a light way that no one could possibly take offence. 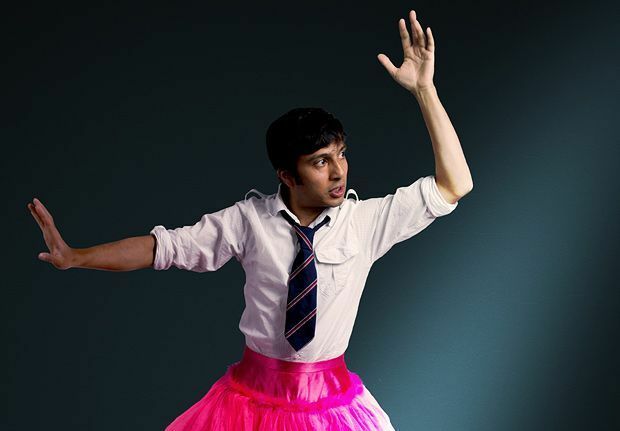 Gilded Balloon, 622 6552, until 31 Aug, 1.45pm, £10–£11 (£9–£10).